A couple of interesting new music production tools have been released this month; Zynaptiq’s ‘Morph 2’ and Errozero’s ‘Acid Machine’. Morph 2 is described as a “real-time structural audio morphing plug-in”. It was originally developed by Prosoniq, but the newly released version 2 has been handled by Zynaptiq, who claim to have enhanced the existing audio processing algorithms, as well as adding various new features and porting it to all platforms. The basic concept behind Morph 2 is one that many producers will have experimented with at some point – that of blending one sound source with another to create an entirely new sound. Zynaptiq describe this as “the sonic equivalent of one object slowly changing its shape to become a different object – for example, one face becoming another”. Morph 2 includes a selection of five different morphing algorithms, a formant shifter and a built-in reverb and it really does look like you could do some genuinely interesting work with this plug-in. There are obvious sound design applications for this software (see the ‘creature’ and robot voices in the video), but you could also do some interesting things with remix parts, or create some really unique sounds that would work in many genres. You can currently download a fully functioning version of the software as a free 30 day trial from the Zynaptiq website. The plug-in works on Windows or OSX, but you will need an iLok account and an iLok 2 for the software to work (the older, first generation iLoks are unfortunately not supported). Watch Morph 2 in action below. Acid Machine is going to be a godsend to anyone who feels that they should be able to spend their day at work making acid house. 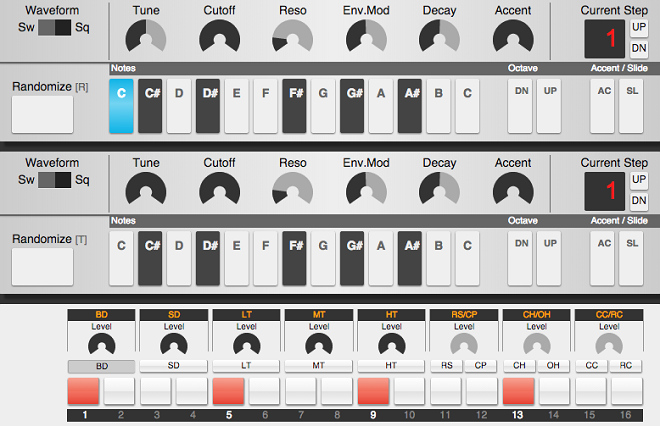 Errozero have created an awesome browser-based TB-303 emulator, which you can try out here. Acid Machine is currently still just a beta version but it works well enough to be really good fun, and you could quite easily waste a fair bit of time on this! It is not completely dissimilar to Propellerhead’s ReBirth, so many people will already be familiar with the idea. Acid Machine gives you two 303 simulators and one drum machine to play with. You can program up to 8 different patterns on each of these three modules, and then punch these patterns into a sequencer at the bottom of the screen. When you are content with your creation, you can save it via a unique URL, or bounce it down as a wav. This is a really simple idea – but a lot of fun.